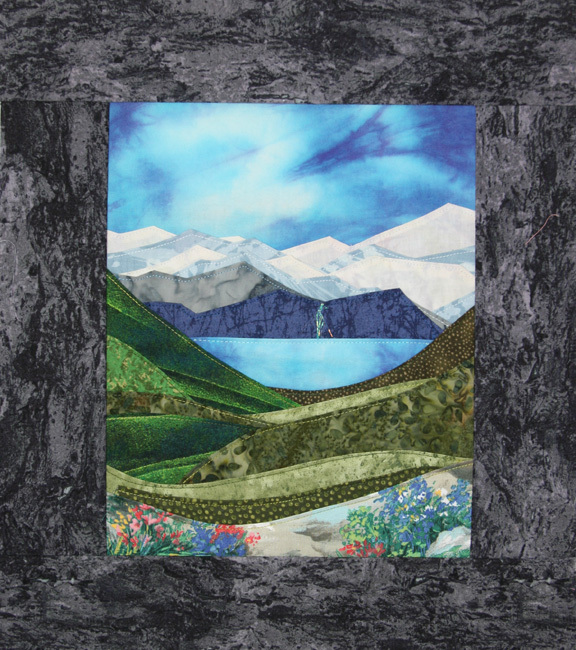 Inspired by the textures, lines and colors found in nature, Karen shares her love of curved piecing and collage, and how it led to the creation of her layered topstitching technique. Wild curves and dramatic angles may look difficult to do, but the process is really easy and quite relaxing! 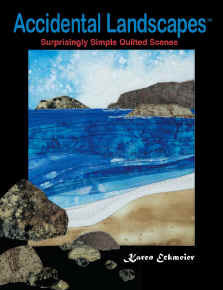 So sit back and let Karen inspire you during this presentation on how to use her topstitching technique to create wiggles & waves, twists & twirls, logs & leaves, Accidental Landscapes™ and even waves to wear. 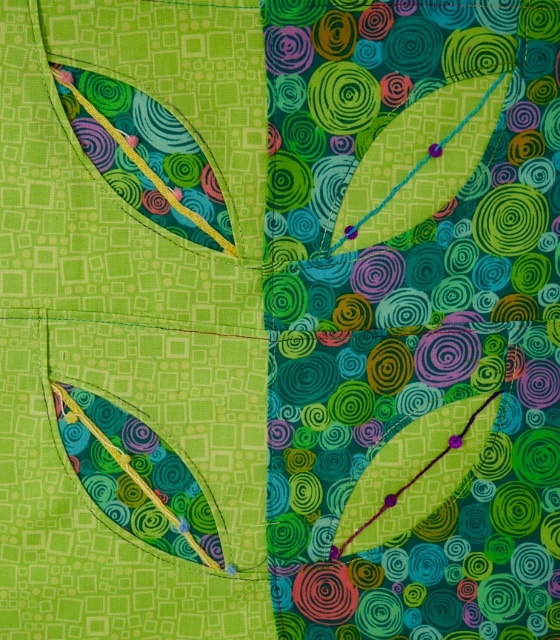 Is it straight-stitch appliqué or raw-edge collage? 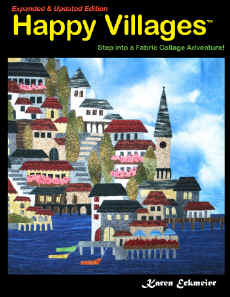 No matter what you call it, the edges of the fabric are bound to fray, but that's OK! 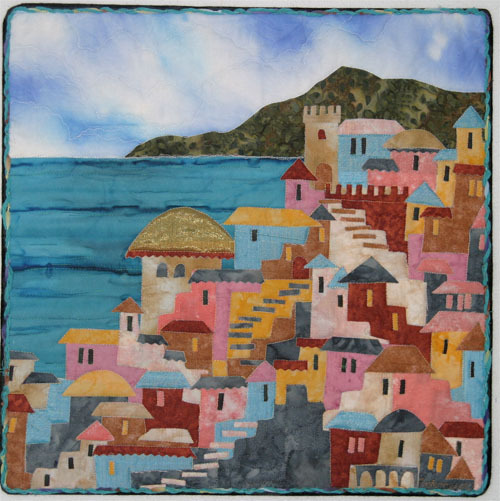 From early hand appliqué pieces, up to her current straight-stitch appliqué series, Karen’s presentation will definitely give you some ideas on where to find inspiration and how to deal with those scary edges encountered along the way. Two totally different techniques with the same fun results! 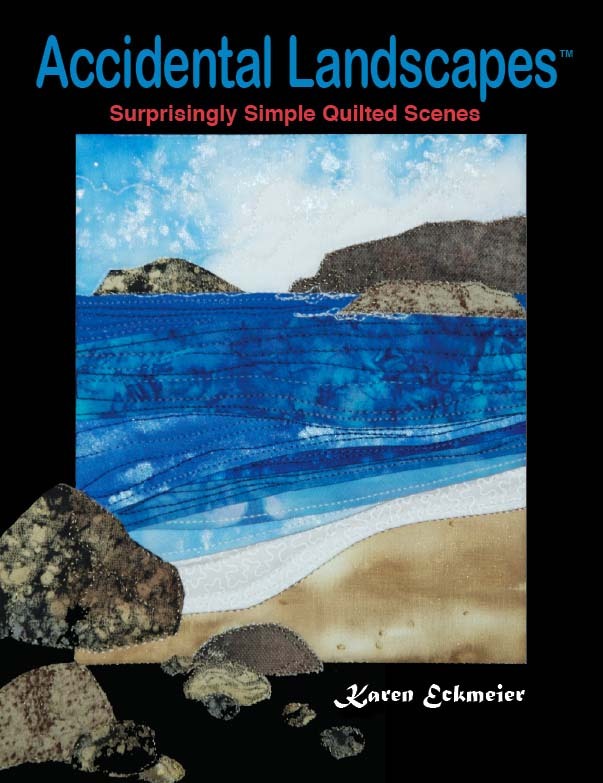 Karen shares her two favorite approaches to playing with fabrics: Fabric collage (Happy Villages) and layered/topstitching (Accidental Landscapes). 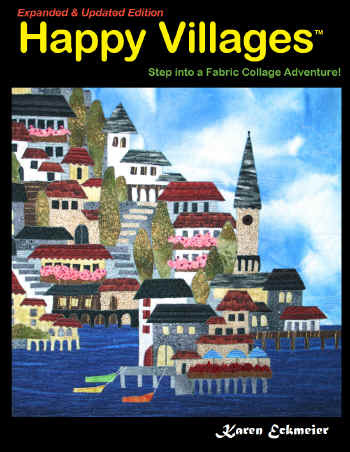 This lighthearted and informative power point presentation will show you how the techniques evolved and will inspire you to try fabric collage or layered/topstitching in your own creations. 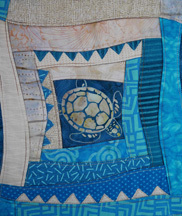 Ease in to gentle free-form topstitched curves in this technique and design workshop. We will make abstract flowers that twist round and round and pairs of Layered Leaves embellished with yarn. 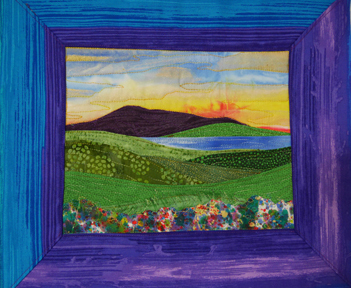 Then experiment with different combinations to see which design layouts appeal best to you for making your choice of a wallhanging, table runner, table topper, a bag or the beginnings of a quilt top. Let’s start with the traditional Log Cabin block and feature a fun image in the center instead of the classic red square. 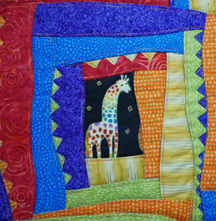 Select a large print and some lights and darks to coordinate with it and you are on your way to building some very sassy blocks with topstitched curves and perky little triangles. Five log blocks make a great table runner and four blocks are perfect for a table topper or bag. 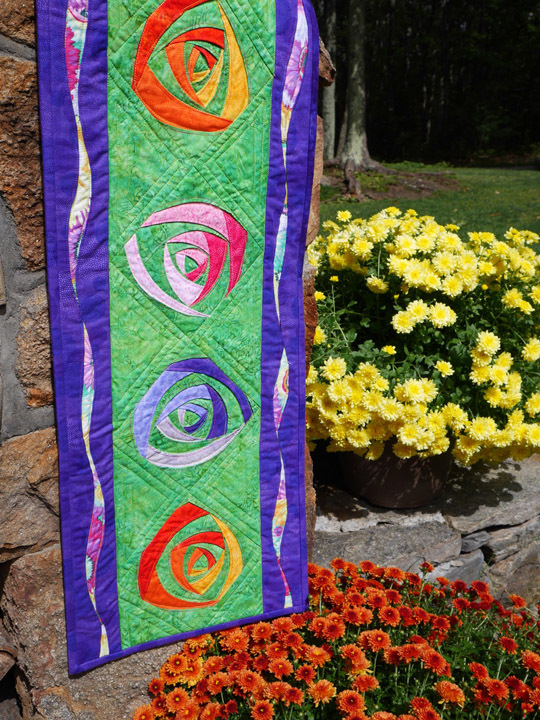 If you want to make a large quilt bring more fabric and continue making blocks. TWO landscapes in ONE workshop! 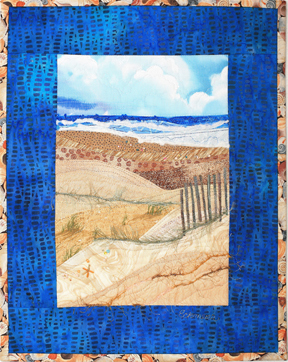 Learn how to use Karen's layered topstitching technique to "accidentally" create a beach scene in the morning and then expand on your newly acquired skills to make a mountain views landscape in the afternoon. These scenes are quick and easy to make, no fuss - just free-form rotary cutting and topstitched edges. Finished sizes vary (approximately 9" x 12" without borders). Students must come prepared to do BOTH landscapes. 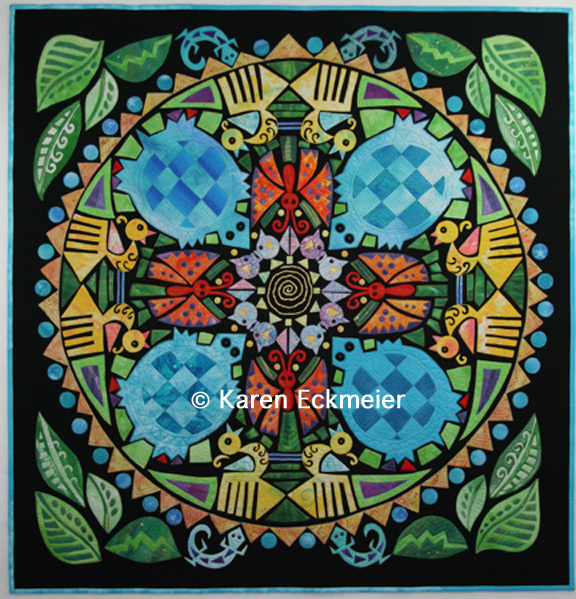 Fabric Kits are available at $25 and may be reserved for workshop participants by contacting me by email or phone. 3 hour: Create one or two Mountain View scenes. Learn how to add Angelina fibers for sparkle. Copyright © Karen Eckmeier 2002-2018 All Rights Reserved. No part of this site may be reproduced in any form without permission. Text and photographs are intended for personal use and are protected under federal copyright laws.